Royal Caribbean's WOW Sale begins today, with up to $300 bonus money to spend onboard the ship. The WOW Sale is valid on bookings made between September 24 – 27, 2018 on all sailings departing on or after October 24, 2018. Free cruise fare for 3rd guests and higher who are 12 years old or younger on 4 nights or longer Alaska, Bahamas, Bermuda, Canada, Caribbean, CaribNE, Coastal, Cuba, Europe and Hawaii sailings departing between September 30, 2018 – May 14, 2019 and September 1, 2019 – December 14, 2019. The Kids Sail Free Bonus excludes sailings between November 17 – November 23, 2018, sailings between December 18, 2018 – January 1, 2019, sailings between February 15 – 18, 2019, sailings between March 16 – 30, 2019, sailings between April 13 – 22, 2019 and sailings between November 23 – 30, 2019. Includes free upgrades from ocean view to balcony when sailing on Anthem of the seas for all sailings departing on or after October 24, 2018. Free upgrades refer to purchasing a Balcony at the price of an ocean view at standard/full fare. BOGO and Deck the Holidays Deals are combinable with WOW Sale, Free Upgrades, NRBD OBC, promotional OBCs, NextCruise offers, Instant Savings, restricted discounts (for example, Seniors, Residents, Military), Crown and Anchor discounts and Shareholder Benefits. BOGO and Kids Sail Free are combinable with WOW Sale, Free Upgrades, NRBD OBC, promotional OBCs, NextCruise offers, Instant Savings, restricted discounts (for example, Seniors, Residents, Military), Crown and Anchor discounts and Shareholder Benefits. Deck the Holiday Deals and Kids Sail Free are not combinable with each other. WOW Sale is combinable with Free Upgrades, NRDB OBC, OBC, instant savings, NextCruise offers, restricted discounts (for example, Senior, Resident, Military) but not combinable with Shareholder benefits and Crown and Anchor discounts. All offers are not combinable with any other offer or promotion, including, but not limited to, Standard Group, Interline, Travel Agent, Travel Agent Friends and Family, Weekly Sales Events, Net Rates. Royal Caribbean's WOW Sale is back, with an opportunity to get up to $200 to spend at sea, plus up to $100 extra on sailings booked 6+ months in advance with a non-refundable deposit. The WOW Sale applies to cruises booked between July 25 – 29, 2018 on sailings departing on or after August 25, 2018. "BOGO" Offer includes 50% off cruise fare of second guest booked in the same stateroom as first full-fare paying guest. Up to $300 onboard credit (OBC) when booking a non-refundable rate 6 months or more prior to cruise departure date and up to $200 OBC if booking a sailing less than 6 months prior to cruise departure date. Onboard credit excludes China departures. Offers free cruise fare for 3rd guests and higher who are 12 years old or younger on 4 nights or longer Bahamas, Bermuda, Canada, Caribbean, CaribNE, Coastal, Europe and Hawaii sailings departing between August 31, 2018 – May 14, 2019. Royal Caribbean's WOW Sale has begun, with 50% off the second guest, up to $300 to spend at sea and kids sail free. WOW Sale has been extended through May 8, 2018! The WOW Sale is available on new bookings made between May 1 and May 6 May 8, 2018 on all sailings departing on or after June 1, 2018, excluding China departures. Kids Sail Free qualify for 4-night or longer Europe, Bahamas, Bermuda, Hawaii, Canada, Coastal and Caribbean sailings departing September 1, 2018 through May 31, 2019. Offer excludes Thanksgiving sailings (departures between November 17 – November 23, 2018) and Holiday sailings (departures between December 17, 2018 – January 1, 2019), President’s day sailings (departures between February 15 – 18, 2019), Spring Break sailings (departures between March 16 – 30, 2019), Holy Week/Easter sailings (departures between April 13 – 22, 2019). BOGO and Kids Sail Free are combinable with each other as well as with WOW Sale, NRBD OBC, promotional OBCs, NextCruise offers, Instant Savings, restricted discounts (for example, Seniors, Residents, Military), Crown and Anchor discounts and Shareholder Benefits. WOW Sale is combinable with NRDB OBC, OBC, instant savings, NextCruise offers, restricted discounts (for example, Senior, Resident, Military) but not combinable with Shareholder benefits and Crown and Anchor discounts. All offers are not combinable with any other offer or promotion, including, but not limited to, Standard Group, Interline, Travel Agent, Travel Agent Friends and Family, Weekly Sales Events, Net Rates. Royal Caribbean's WOW Sale begins today, with stackable savings that provides 50% off the second guest, plus up to $200 onboard credit. The WOW Sale is valid on cruises booked between 2/7/18 and 2/11/18 to sailings departing on or after 3/7/18. 30% off cruise fare for all guests’ in the stateroom. $200 OBC for Suite on sailings 6 nights or longer. WOW Sale is combinable with select promotions. WOW Sale is open to residents of U.S. or Canada. Cruises booked between October 18, 2017 through October 22, 2017 at 11:59 p.m. EST on sailings on or after November 18, 2017 are eligible for the WOW Sale (excluding China departures). 3rd and 4th guests 12 years and younger free cruise fare. Guests 12 & under sail free on 4 nights or longer Europe, Bahamas, Bermuda, Hawaii, Coastal and Caribbean sailings departing November 1, 2017- December 31, 2018. Excludes SY sailings and sailings departing 11/17/17-11/27/17, 12/17/17 – 1/8/18, 2/15/18-2/20/18, 3/10/18-4/1/18, 5/15/18-9/1/18, 11/17/18-11/22/18 and 12/15/18-12/31/18. Holiday sailings departing from December 19, 2017 through December 31, 2017 and December 18, 2018 through December 31, 2018. Deck the Holidays and WOW Sale offers exclude China departures. BOGO does not apply to third and higher occupancy guests. BOGO offer is combinable with NRDB OBC, Kids Sail Free, promotional OBCs and instant savings, NextCruise offers, restricted discounts (for example, Senior, Resident, Military), Crown and Anchor discounts and Shareholder Benefits. Deck the Holidays and WOW Sale are combinable with each other, NextCruise offers, NRDB OBC, and restricted discounts (for example, Senior, Resident, Military) but is not combinable with Shareholder benefits and Crown and Anchor discounts. BOGO50 bookings made for China departures are combinable with NextCruise offers and Crown and Anchor balcony/suites discounts only. All offers are not combinable with any other offer or promotion, including, but not limited to, Standard Group, Interline, Travel Agent, Travel Agent Friends and Family, Weekly Sales Events, Net Rates. 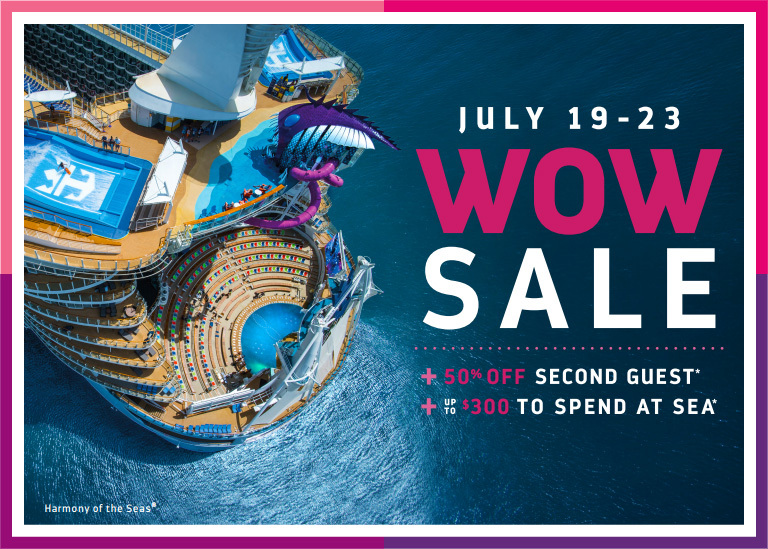 Royal Caribbean's WOW Sale begins today, with stackable savings that provide bonus onboard credit and reduced deposit on top of the current July BOGO 50% offer. Cruises booked between 7/19/17 through 7/23/17 on sailings on or after 8/9/17 are eligible for the WOW Sale (excluding China departures). Sailings departing from 12/19/17 through 12/31/17 and 12/18/18 through 12/31/18. WOW Sale is combinable BOGO50, 25% Savings for 3rd and 4th Guests, NextCruise offers, NRDB OBC, restricted discounts (for example, Seniors, Residents, Military). WOW Sale is not combinable with Shareholder Benefits and Crown and Anchor discounts. All offers are not combinable with any other offer or promotion, including, but not limited to, Standard Group, Interline, Travel Agent, Travel Agent Friends and Family, Weekly Sales Events, Net Rates. 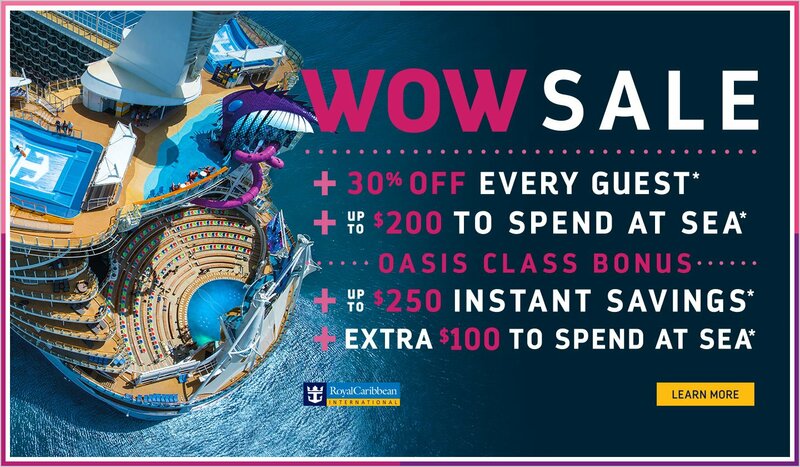 Royal Caribbean's WOW Sale begins today, with 30% off all guests and up to $200 to spend at sea, plus bonus savings on Oasis Class ships. The WOW Sale applies to cruises booked between May 3-7, 2017 on all sailings departing on or after June 3, 2017. Offer excludes China departures. 30% off all guests Maycation offer. If you choose to sail on an Oasis Class ship on sailings departing June 3, 2017 through September 30, 2017, you can qualify for additional savings. WOW Sale is combinable with Maycation 30%, standard/full fare rates and Next Cruise offers. WOW Sale is not combinable with restricted rates (for example, Seniors, Residents, Military, etc. ), Crown & Anchor discounts, Shareholder Benefits or Loyal to Royal Sales. All offers are not combinable with any other offer or promotion, including, but not limited to, Standard Group, Interline, Travel Agent, Travel Agent Friends and Family, Weekly Sales Events, and Net Rates. After the Offer Period, the Offer will be removed from the booking if the guest cancels and reinstates the booking or rebooks into a new booking on the same ship and sail date, applies a fare change, or changes the ship or sail date of the booking; certain other changes to the booking may also result in removal of the Offer. 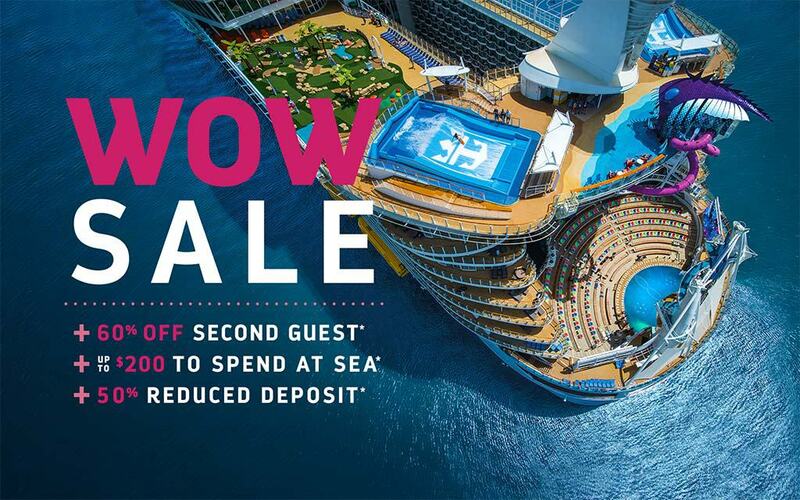 Royal Caribbean will kick off its next promotion with the return of a WOW Sale, which will offer 60% off second guest, up to $200 to spend at sea and 50% reduced deposit. For five days, The October WOW Sale will run, with a special preview just for Crown and Anchor Society Members. A valid Crown & Anchor Society membership number must be included in the reservation to book any sailing during the Crown & Anchor Society preview. This WOW sale is open to Crown and Anchor Society Members beginning at noon ET on October 12, and the general public October 13-19, 2017. It is valid on all sailings departing on or after November 12, 2016, excluding China departures. WOW Sale and Holiday Bonus are combinable with BOGO60, standard/full fare and restricted rates (for example, Seniors, Residents, Military, etc.) and Next Cruise offers. WOW Sale is not combinable Crown & Anchor discounts, Shareholder Benefits or Loyal to Royal Sales. All offers are not combinable with any other offer or promotion, including, but not limited to, Standard Group, Interline, Travel Agent, Travel Agent Friends and Family, Weekly Sales Events, and Net Rates.